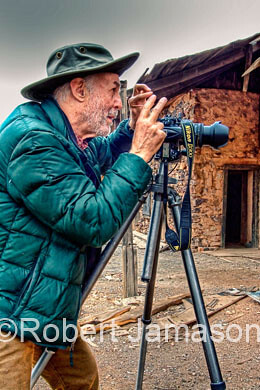 We photographers, models and photo assistants gathered in Vulture Ghost Town, but spent much of our time photographing one another. ©Bert Gildart: Sadly Janie and I have just departed the Prescott area – and the friends we’ve made through another friend we met a number of years ago associated with our love of Airstream travel and photography. 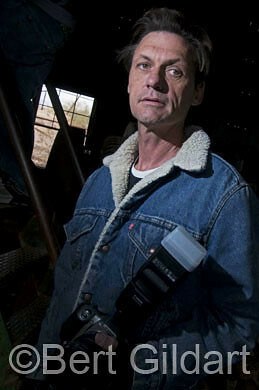 Rich Charpentier was the catalyst that brought us together and he did so at a most interesting place, Vulture Ghost Town. Our group included Rich, Robert, Igor, Chris, Jen, Sean, and Michael. Rich and Robert are the photographers whose work I’ve been describing in recent posts, while the others formed a part of Robert’s crew. Igor is from Russia, had a wonderful sense of humor and also functioned as a part of Robert’s lighting crew. Sean and Jen served as models extraordinaire. Michael and Chris were two of Robert’s children and also served as models. You can see them all on Robert’s web site. Click and then go to “A Bit Of Everything.” That’s us! As well, you can also see images of both Janie and me on Robert’s site which are highly stylized. 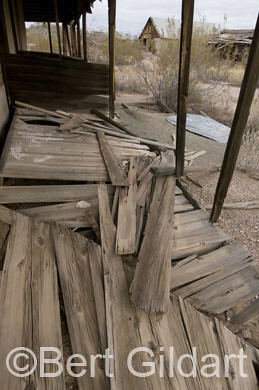 You can see images of me (but more significantly of our visit to Vulture Ghost Town) on Rich’s site. His work from the area forms the basis for an informative discussions on photo techniques, specifically, his use of Topaz. It’s well worth your time logging onto his blog. Both Robert and Rich are way ahead of me when it comes to image manipulation, but I’ve picked up a little from our four night stay in Prescott at Point of Rocks RV Park where Rich has been living now for the past two years. As well, I’ve been reading Scott Kelby’s book, which is the Bible when it comes to digital photography. He’s produced a number of books, and the one I’m currently glued to is his one on Lightroom2. Some of these images I’ve manipulated, others I have not. 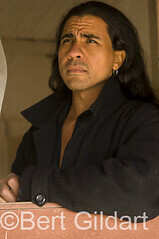 The two images or Sean, the Native American, dramatize how an image can be greatly improved using Lightroom2. 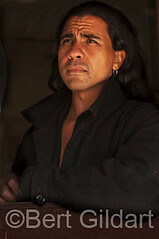 Photographer Robert Jamason who is now creating a body of highly stylized work. I’ve posted a link to his website and it is well worth visiting. The image of Robert just above shows how a single light can be positioned well off camera and used to dramatize the characteristics of a man who is a great photographer. The technique is one I’ve used often and Nikon’s system of wireless lighting makes the technique relatively easy. Two Images of Sean Vasquez illustrating the degree to which Photoshop and Lightroom can transform a good image into a much, much better one. Finally, the image of the ghost town (shown first, above) has also been manipulated using Lightroom2. Because the boards in the foreground were so light I darkened them using a technique I just learned from Lightroom2. Though I could also use the burn tool in Photoshop it doesn’t’ work anywhere near as well as do tools from Lightroom. I’m writing this blog from Quartzite, Arizona, but will be posting more about our travels from Chaco and from our stay with Rich in Prescott when we settle in at Anza Borrego. We expect to be there for almost a month. This huge California state park is one of our favorites and while there I have a number of assignment. Highly stylized image of me taken by Robert Jamason, later converted using PhotoShop to impart a gritty and perhaps even surrealistic appearance. As well, I’ll be producing a cover for a travel magazine, so though it may sound like a vacation, we’ll be very busy. I’m also hoping to devote time to learning more about creating the stylized work such as that produced by Robert and Rich. Though I’m certainly not abandoning conventional photography, I believe these relatively new programs provide tools that can be used to better convey the feeling of a place. This entry was posted on Tuesday, December 15th, 2009 at 8:40 am and is filed under Photography, RV Travel, Travel. You can follow any responses to this entry through the RSS 2.0 feed. You can leave a response, or trackback from your own site. Oh Bert and Janie …….., you do live an exciting life and it looks like with a touch of “naughty” thrown in for good measure. We went to Richard’s site as you suggested and clicked on “A Bit Of Everything,” but it took a while to find your ‘thumb nails.” They were not the first thing that drew our attention! Keep the blog rolling as we are living vicariously through you right now.